[New for 2011, Retired 2014] I cant help myself. When I hear there is a new flavor, I have to go look for it immediately (or at least the next day). I zipped over to Target at lunch to find the two new Scoop It Forward flavors. First I found a ton of last years volunteering flavors. I kept looking and then I finally found just a few pints of the terribly named Volun-Tiramisu hiding at the top. Bummer, no Peanut Butter World. Here it is: Coffee Mascarpone Ice Cream with Cocoa Duster Coffee Rum Lady Finger Pieces. I'm pretty sure that's the most robust description I've ever seen on an inclusion (mix-in). I don't know about you, but all I see is Tsunami when I read the label. I cracked the pint open and it smells... sweet, very sweet. Ok, let's start with a few scoops of just the base actually. It's sweet. Definitely tiramisu-ish. I'm getting the coffee vibe, but not crazy like. More of a rich, sweet coffee-ish base. For every bite I take, I instantly want another. It's going down real easy, but maybe because it's a bit soft. Wow, all I see is finger pieces everywhere! Crazy, I've got 4 on my fork! They are tougher than I thought they would be, but that's not a bad thing. We've got some resistance going on when I bite them. It's like a very solid cake or maybe even a super soft cookie. Now it's fairly soft from the car ride back so eating the edge is like drinking a tiramisu milkshake. 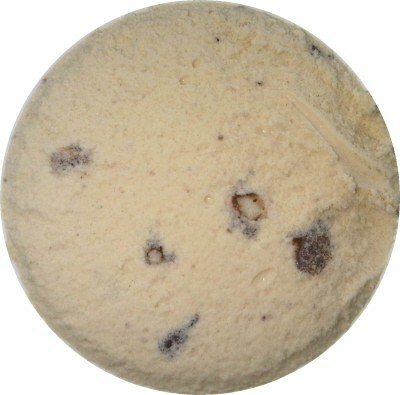 Actually, reminds of like a mild mocha shake. hmmm, I seem to have found a coffee-like flavor that I can tolerate. Someone at work was teasing me that drinking coffee is all about mastering the cream and sugar, and that seems to be what is trying to win me over here. You know, I think I'm glad it's a straight flavor and not a swirl. There's nothing wrong with consistancy in a flavor like this. I think I'm filling up. Mmm, more bites. I'm definitely appreciating the uniqueness of them. As with all cake like bits, I'm not sure I can taste them directly because the base is too sweet and too flavorful. These bits just aren't something you find in ice cream. Ofcourse, their texture might be enhanced by the fact my ice cream is a bit soft, so keep that in mind when you try this one. Ok, I put it away. Well, this is definitely an interesting one. Coffee lovers will adore this one, and the rest of us will try it, some of us repeatedly. It's coffee, but not too coffee. It's pretty sweet, but not crazy sweet. It's got unique mix ins. Unless you despise coffee even more than I do, I say give this one a try. YOU NEED TO TRY THE NEW CAKE BLUE BUNNY ICE CREAMS!!!!! That's funny, when I was at Super Target they didn't have any Peanut Butter World on the shelf either. But I just asked if they had any in the back and they did. Yay for not being shy! ah, you finally enjoy a coffee flavored one. welcome to the dark side. i'd never heard of this flavor until you posted this, and now i am dying to try it. how large exactly were the ladyfinger pieces? dime sized? bigger? smaller? and your coworker was wrong. drinking coffee any way other than black is like putting soy sauce on sushi. it's just wrong. @anonymous: STOP YELLING! just kidding, I have some in the freezer. I was way more curious about this than the peanut butter world. I'm not much of a coffee fan either, but if you can stand it looks like I should give it a shot. Great Review Dubba. Thanks so much for reviewing this. Otherwise, I might not have known about this flavor. Tiramisu is my favorite dessert, so I cannot wait to get over to my local Target and buy this. ooh i think i would like this, even though im not a huge fan of coffee i am partial to a coffee ice cream now and then yum! I hate coffee to drink but love it in ice cream. 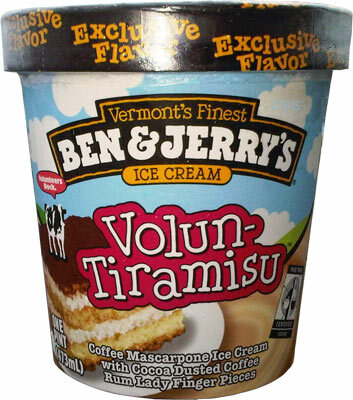 I love Voluntarymisu because if there's one complaint I have with B&J's is that most of the time they put one too many add-ins in the mix. This is a nice basic flavor. Ice Cream and cake pieces. Yummy! And I'm glad to know everyone is getting pints chock full of the ladyfingers because I couldn't believe how many there were! Totally recommend this if you like Haagen Daazs Bailey's or Dublin Mudslide. This is so good. I just had it a minute ago. Well, I don't like coffee, but just like I loved Ben and Jerry's Bonnaroo Buzz, another coffee ice cream flavor, I loved this flavor, too! So, even those who don't like coffee may like this ice cream. And this is another example of why Ben and Jerry's is the best in the ice cream making business, in my opinion; they take foods that I normally dislike, such as fruits, and make me love it in their ice creams, and they take ice cream flavors that I have never liked from other companies, such as fruit-flavored ice creams, coffee-flavored ice creams, and chocolate-flavored ice creams and make me love their versions of them. The only complaint I have with this ice cream is the mix-ins. When I buy Ben and Jerry's I have high expectations for their mix-ins because they are known for the sizes and quantity of them in the ice cream. The lady fingers in Volun-tiramisu are small for Ben and Jerry's and not as numerous as the mix-ins in their other ice creams. Other than that, this ice cream is amazing. With Bonnaroo Buzz, this is definitely a re-buy and and an ice cream I will certainly purchase often. I bought this a few weeks ago. I wasn't sure if I would like it since I am not a big fan of coffee or tiramisu. I loved this, the coffe flavor wasn't overpowering and the marscapone flavor was nice. My only negative comment is that the lady fingers were soft. I wish they had a crunch to them. I'm not a fan of coffee but I love tiramisu and I love love love this ice cream. I just discovered this flavor a week ago and I've already bought six pints of it. I love everything about the ice cream and could probably eat it every day. It taste just like tiramisu to me. If you like tiramisu like I do you have to try it.